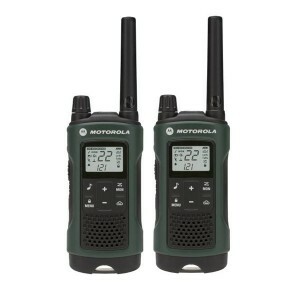 Two way radios (or walkie talkies) are a necessity when camping in a group of two or more. Cell phone coverage is unavailable in many camping areas, making radios the only way to keep in touch. It is also common for a GMRS two way radio to provide access to NOAA weather information. This can be critical, even life saving, when staying in remote outdoor locations. Range - Terrain at camp sites is commonly hilly and wooded, the opposite of what is ideal for a two way radio. A higher powered model can often provide around a mile of range in tough terrain. A weaker model may limit you to a quarter mile or less. NOAA Weather Information - Knowing that severe weather is approaching in advance is extremely important, especially in remote locations. Battery Life - Without power outlets being readily available, keeping your radio charged is a big concern. Look for models with extremely long battery life, or those that have the ability to operate on standard AA or AAA batteries in a pinch. Introducing the Olympia R300, the rugged radio for outdoor adventure! Packed with 50 channels (22 FRS/GMRS, plus 28 extra), 121 privacy codes and 20 call tones, the R300 has the features you need in an FRS/GMRS transceiver at a budget friendly price! The R300 also has 11 weather channels (7 NOAA) to alert you to the elements and is rated IP54 water resistant so it can take the elements. Dual power options and Micro-USB charging give the R300 the ability to operate wherever you need to go! Be prepared for the unexpected with the Motorola Talkabout T480 FRS/GMRS two way radio! The T480 helps you stay connected and ready for an emergency when cell phone service is down or you lose power. It has 22 FRS/GMRS channels, NOAA weather channels, weather alerts and an FM radio to keep you and your family informed during emergency situations. 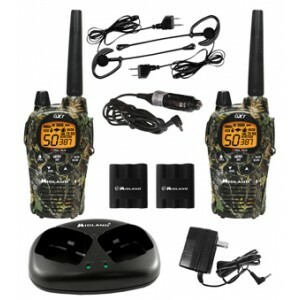 The Midland Base Camp XT511 combines a powerful FRS/GMRS two way radio with an emergency crank radio! 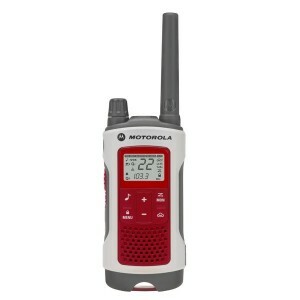 The XT511 also features a flashlight, an AM/FM radio, and a NOAA weather alert radio. The Midland XT511 can be is perfect for emergencies, as it includes both an AC wall power adapter and DC vehicle adapter. The Base Camp XT511 can also operate on battery power (included rechargeable battery or 4 "AA"). The rechargeable battery can be charged using the AC/DC adapters, or by turning the Dynamo crank.